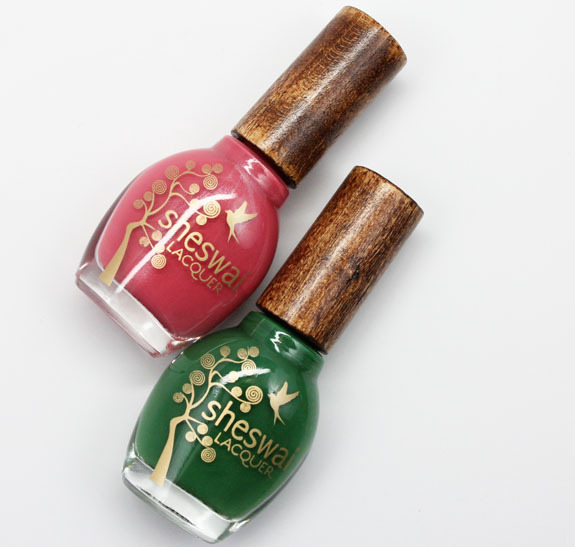 Sheswai Nail Lacquer has three new shades out for spring 2013, and I’ve got two of them for ya today! As you may already know, or can tell just by looking, Sheswai has some seriously cute bottles. I think they are the prettiest out there actually. I love the design on the front, but even more so, I love the bottle caps, which are made from sustainably harvested wood grown on family farms. And they are big-three free and cruelty-free to boot! Ladylike is a warm rose pink with pink shimmer. The shimmer is on the subtle side, but not hidden. You can see it in lower lighting still. Really nice creamy formula with not a single issue. This was two coats. Perfect for spring and summer. Dig It is a vivid grass green creme. This is a gorgeous shade and excellent formula. Something about this green speaks to me. It’s bright yet deep, and so clean and crisp. Just two coats. This might be my favorite green creme in a long time! 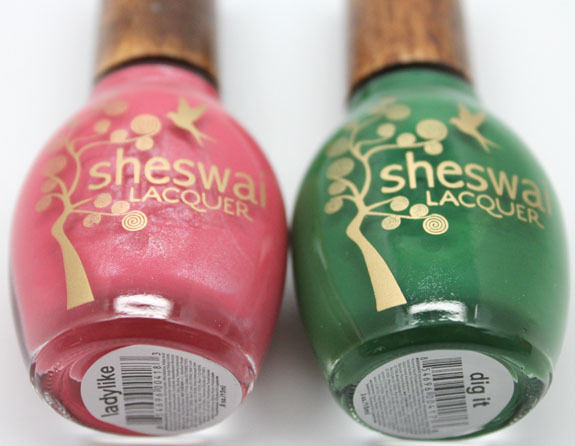 Overall: Sheswai Nail Lacquer might not be inexpensive, but you get what you pay for. They have unique shades, a really good formula, made in the USA, and are an eco and animal-friendly company. What do you think about Ladylike and Dig It? Vampy Varnish 9th Blog Anniversary Giveaway!